I recently read an article about the benefits of distributed energy generation, which focused on the economic benefits for local communities. I agree with everything in that article, but it occurred to me that someone should write about the technological advantages of distributed generation systems, so I found a few studies by the US Department of Energy and condensed their results down to a few key points that I'll present here. Distributed generation is what Thomas Edison envisioned with his DC generators: a power station on every city block, making long-distance transmission and its associated losses irrelevant. At the time, however, it seemed more feasible to go with Tesla’s AC generators and long transmission lines. Now that we’ve had the AC grid for a century, we’re starting to see its shortcomings and a return to the concept of microgrids and distributed energy generation. Storms, falling tree branches, brownouts, and acts of terror all threaten the grid, and when it fails, it typically leaves tens of thousands of customers (or millions in extreme cases) without power for long periods of time. After Hurricane Sandy hit the east coast, a few individuals with solar panels were providing emergency power to their neighbors. 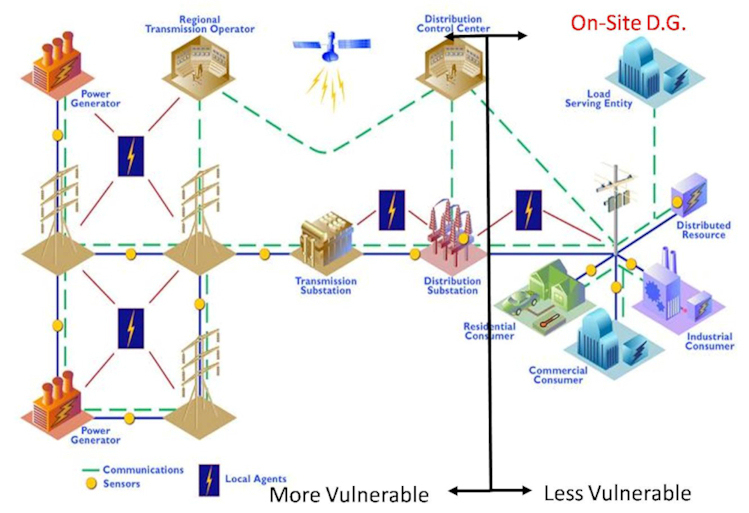 A distributed generation system with microgrids can localize the impact of these failures, reducing the number of people affected. Big power plants - whether they’re based on fossil fuels, nuclear energy, or renewable energy - are expensive to build and have very long payback periods. That means the utilities are slower to adopt new technologies. If I just spent $40B on a natural gas electrical generating plant, I’m not likely to abandon that and switch to another fuel or a renewable source, even if the price of natural gas rises. On the other hand, if I build several smaller plants based on renewable sources, I can easily decommission them a little at a time as I experiment with and adopt new technologies. Suppose I built a large wind farm with turbines that have an expected life of 30 years. Turbine efficiency is likely to improve over the next few years, but it’s too costly to replace an entire farm at once. And since the farm is designed as a whole - each turbine affects its neighbors - I can’t simply replace a few turbines with newer models. Smaller wind farms in more locations would allow me to adopt the newer turbines in one or two of the farms, gradually increasing my production without making a major investment in equipment. One reason large power plants are expensive to build is that so few of them are built - it’s a highly specialized market. If I build a lot of small power plants with whatever technology is appropriate, the mass production effect will drive down the cost. Distributed generation allows me to use a variety of power generating technologies, decreasing my dependence on any one resource. With stock portfolios, organizations, and energy, there is strength in diversity. The US Energy Information Administration reports that 7% of the electricity generated is lost in transmission and distribution. Decrease the distance that it travels and you decrease the amount that’s lost.